A rackmount duplicator is a type of manual disc copying equipment that requires user intervention for proper operation and differs from a tower duplicator in its orientation; it rests horizontally rather than vertically (like a tower). 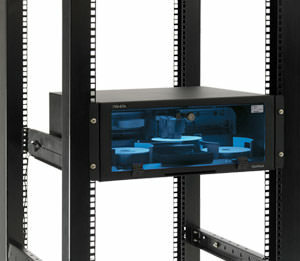 Rackmount CD and DVD duplicators operate as standalone equipment that does not require a separate computer. They have between 1 and 7 destination drives available depending on production requirements. Due to their unique layout, rackmount disc duplicators are ideal for copying optical media in specific environments such as server rooms, radio and television stations, production houses, schools, churches, and so on. This is because they are easily mounted to a wall and stacked instead of set on tables or filing cabinets that take up counter space. They do not need as much space as other models and only need a protected power strip to turn on.They also allow more room for other equipment such as printers and other reproduction devices. Sometimes, installation kits may not be included with purchase. They could be considered an additional accessory and therefore subject to additional costs. However the construction of rackmount duplicators is fairly simple and straightforward, comprising of screws and metal racks. It is recommended that you do not install it directly in the path of sunlight or air conditioning flow. Also, keep water, heat, and dust away to preserve the integrity of the reproduction equipment. All features and controls are typically accessible from the front panel of a rack mounted device. Copying discs uses the same load-and-go procedure found with tower duplicators.